Copenhagenize.com - Bicycle Urbanism by Design: Hope for India? And China? Hope for India? And China? A colleague at the City of Copenhagen's bicycle office sent me this photo from India where, in many cities, the bicycle is still present en masse. Much is said about the decline in cycling in China and India is also dramatically increasing its levels of car ownership. Seeing the above photo made me think of how it used to be in China. Steve Vance, in a comment on Flickr, reminded me of the classic film Return of the Scorcher, made in the early 1990's. If you haven't seen it, do so. It's just under 30 minutes. It shows bicycle life in China, Amsterdam and cities in America. We are so often caught up in the current boom in cycling that it's worthwhile to see this film from the early 1990's. Not least for the great footage from China and the unchanged images of Amsterdam. I travelled in China twice. 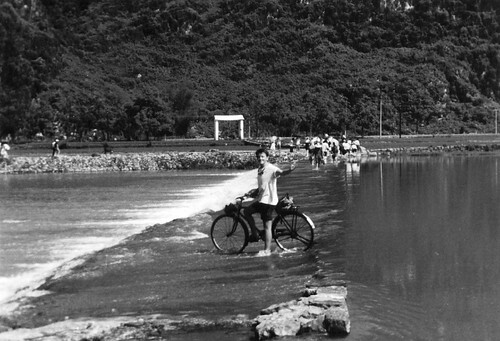 First time was in 1990 where I rode around on a Chinese bicycle. It wasn't allowed to bring bicycles into China back then. You needed special permission and it was a confusing bureaucratic process. I share the views of Bliss in the film about his being stunned at the levels of bicycle traffic in Beijing. I remember clearly riding on a roundabout in the afternoon rush hour. A massive roundabout which probably has four lanes of cars these days, and I couldn't get off. I had to ride around three times before edging my way far enough to the edge to exit down the street I needed. The swarm of bicycles was more like a swarm of butterflies than hornets. The pace was relaxed. Still, I required some practice to get into the mindset. I did, eventually. Like I said, China's bicycle culture is under threat. There are, however, cities that have woken up and smelled the car fumes. Protected infrastructure is being built. A colleague of mine is involved in a project in a large Chinese city where they have realised that implementing Danish-style infrastructure is the key. I'll be blogging about it soon. So there is hope. If Chinese cities start back-pedalling on their car culture it may send the right signals to India who can avoid the same dark decade.